22 teams of triples played off in the last elimination games in the ARENA Living Open Mixed Triples. The next outing will be the final- on the 5th of March. The winner of the day was the team of Sandra Coombe(skip), Jo Baxter and Bruce Aley. The other 4 winner, however with less ends, were Judith Seagar, Neil Buckner and Gordon Ross. In third place with 3 and a half were Kevin Cameron, Arthur and Janne Beale with some help from Raewyn Parker. 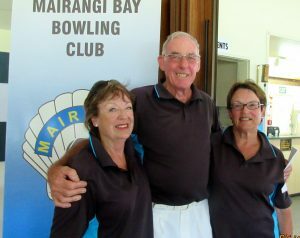 The 4th place was the team of Con Kater, Des Lowe and Betty Baillie.